Every ruin and defaced statue speaks volumes of its past grandeur. Even in the present state, the ruins of Hampi elicit superlative praise from many tourists and archeology buffs. And rightly so, because exploring all of it- temples – is a rare delight. If you wish to improve your mind in the contemplation of works of art and architecture, Hampi in the state of Karnataka is well equipped to satisfy your appetite. 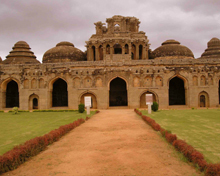 Hampi was the focal point of the golden age of the Vijayanagara Empire. 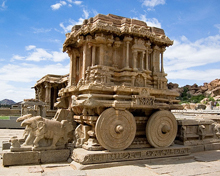 Any traveler visiting India will be blown away by Hampi history. The ghost city of Hampi, once the capital of powerful Vijayanagara Empire, is now a UNESCO World Heritage Site. 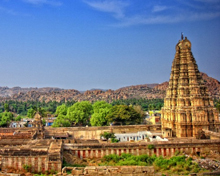 The splendor and affluence of Hampi, capital of the powerful Hindu Kingdom of Vijayanagara ("City of Victory") on the Tungabhadra River, has been described in the accounts of European travellers who visited India during the period. Prominent among them are the Italian Nicolo dei Conti (15th century AD) and the Portuguese travelers Paes and Nuniz who visited India in the 16th century. The city was mercilessly sacked by the marauding armies of the Muslim Sultanates of Deccan after their coalition defeated the de facto ruler of Vijayanagara, Ram Raja, in the famous battle of Talikota in 1556. One of the famous monuments of Hampi, Hazara Rama Temple was built during the reign of Krishnadeva Raya (AD 1509-30), the greatest of the Vijayanagara kingdom. Dedicated to Lord Rama, the temple was used by the royals to worship. Embellished with exquisite carvings depicting scenes from the Ramayana, the Hazara Rama Temple is characterised by polished black granite pillars. Dedicated to Virupaksha, Virupaksha Temple is one of Hampi’s oldest structures and still functional. The early Vijayanagara rulers are said to rule on behalf of Virupaksha, who was a Shaivite deity. The nine storied gopuram (gateway tower), about 50m high, dominates the skyline of Hampi. Located on the Hemakuta Hill, the awe-inspiring 6.7 m monolith depicting the man-lion incarnation of Vishnu is seated in a cross-legged yoga position on a seven-hooded serpent. Located adajascent to the Lakshminarasimha is the Krishna Temple built in 1513 and enshrines a idol of Bala Krishna. 2km from Hampi Bazaar, on a high elevation, is located the crowing glory of the Hampi ruins, the Vittala Temple, dedicated to Lord Vishnu. Probably built during the reign of Krishnadeva Raya, the temple is marked by amazing sculptural work which is testimony to the zenith of the Vijayanagar art. The ornate solid stone chariot, representing Vishnu’s vehicle, in the courtyard is the Vittala temple is the main attraction. The wheels of the chariot were once capable of turning on their axles. Some ½ Km to the northeast of the Hazara Rama Temple, within an irregular rectangular wall, are the remains of three palaces, three watch-towers, a pond, a store & a double-storeyed palace. Here is located the visually attratcinng Lotus Mahal, the two-story Indo-Saracenic pavilion. The Kamala (Lotus) Mahal overlooks the 11 grand Elephant Stables, a massive edifice with arched entrances and domed chambers that once housed the magnificent state elephants. The Government of Karnataka holds a colourful festival of dance and music every year in Hampi. This festival, held during first week of November, attracts tourists in large numbers. 156 km from Hampi, Aihole is considered to be cradle of the Hindu temple architecture. The place is a famous travel destination on its own right thanks to its vast assembly of cave temples. The place is home to about 125 temples divided into 22 groups. Durga temple is the most famous of the temples in Aihole. Ladh Khan Temple, Surya Narayan Temple, Gauda Temple, Kondi Group of Temples, Maguti Temple, Hucchimalli Temple and Ravanphadi Cave are other attractions in Aihole. 173 km from Hampi, Pattadakal is an alluring destination for tourists for its awe inspiring chiseled temples built by the Chalukyas in the 7th and 8th centuries AD. Located on the banks of the Malaprabha River this World Heritage Site is home to several temples including Virupaksha Temple, Sangameshvara Temple, Chandrashekhara temple, Mallikarjuna Temple, Khadasiddheshwara Temple, Jambulinga Temple and Galaganatha Temple. Of these, Virupaksha Temple is the grandest of all. 180 km from Hampi, Badami is famous for several temples constructed by the Chalukyas of Vatapi during the sixth-seventh century A.D. Some of these are magnificent rock-cut cave temples, while others are structural. During the Chalukyan times the temple architecture reached its zenith. The early Chalukyas had made their mark in history as prolific builders. By Air: The nearest airport is Hubli (151 Km.) which is connected by flights with Bangalore. By Rail: The nearest railhead Hospet (13 Km.) is connected by rail with Bangalore, Hubli and Guntakal. By Road: Hampi is connected by good motorable road with Hospet (13 km), Bellary (74 Km), Gadag (98 Km), Hubli (151 km), Guntakal (133 km), Chitradurga (151 Km), Aihole (156 Km), Pattadakal (173 km), Badami (180 Km), Dharwad (181 Km), Bijapur (248 km), Belgaum (259 Km), Gulbarga (264 km), Bangalore (325 km), Panaji (325 km), Bidar (379 km) , Hassan (353 km), Mangalore (404 km), Mysore (491 km). Hampi is connected by frequent bus services with Hospet. Gopi Guest House, Padma Guest House, Vicky Guest House, Vishnu Guest House, Pushpa Guest House are some of the accommodation options in Hampi. Laughing Buddha restaurant, the Goan Corner, Mango Tree and Garden Paradise are some of the famous eateries in Hampi.